I am, reluctantly, convinced of the merits of the Brahms String Quartet in A minor op.51, no.2. I just have yet to be touched, charmed or moved by it. I’ve tried to let the Emerson and the Takács Quartets do that for me, but they only offered excellence, not grit or inescapable passion. Three’s a charm though, and the third recording of the A minor quartet I’ve come across this year may have done it for me. When Brahms develops a 35 minute quartet out of just a few basic musical building blocks, the result is - or can be - an expressive stringency of which Hugo Wolf declared Brahms the “undisputed master of composing without ideas”. Even Britten quipped that it wasn’t bad Brahms that he minded, but good Brahms that he couldn’t stand. Usually I’d snicker with delighted, if embarrassed agreement – at least where Brahms’ string quartets are concerned. But the combination of cohesion and energy of the Mandelring Quartett (who played Brahms at the Library of Congress in 2006) makes for an unusually compelling, indeed spellbinding performance. Brahms, for once, seems successfully to reach the pinnacle of a composer’s ambition that is the string quartet with op.51/2. This is a string quartet that fascinated Schoenberg for its economy of means and made him famously declare Brahms ‘a progressive’. I will have to explore the other two volumes of their Brahms traversal – made only more attractive by their inclusion of string quartets of (forgotten) contemporaries of Brahms. If ever issued as a set – hopefully retaining the ‘fillers’ – it might well vie for the reference recording spot with the Alban Berg Quartet’s EMI recording. This disc is worth a strong recommendation for the Brahms A minor alone. But there is more. Rather than point out that the ‘filler’ on the Brahms is “this neat, unknown F.O. 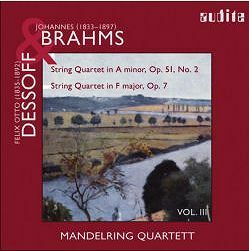 Dessoff”, the performance and the quartet deserve to be mentioned, praised, and recommended separately. In fact, I’d give this disc the same two thumbs up even if it only included either of the two quartets. That’s not only because the playing is outstanding but also because Dessoff’s op.7 is much more than just an afterthought to the Brahms quartet. It’s a wonderful work that deserves to be smack-dab in the middle of the string quartet repertoire of more groups than just the Mandelring. Brahms himself, a friend of Dessoff’s, found to have “such an unassuming face that one hardly dare praise it out loud … It would greatly please me to have my name printed on the front page of this quartet that is amiable smiling at me …”. Holger Best’s liner-notes mention that Dessoff did not want to sully his reputation as a great performer with a second-rate composition. He need not have worried in this case. The F major quartet smiles amiably, indeed. All four movements are ear-catching, a joy to listen to, unpretentious, simple but not simplistic, full of joy but not silly. What makes it so immediately and lastingly enjoyable is perhaps that skilled but still not so very seriously well crafted Brahms element in it, or the fact that it is perfectly romantic without being burdened with dreamy portentousness - Schumann, some may say. The delicate pizzicato theme running through the opening Larghetto merges with beautiful lyrical lines for an exquisite slow movement. The Poco andantino has Viennese café-house mood and gaiety running through its veins … and that from a cool northern German! The outer movements, a driving Allegro ben moderato and a busy Allegro con brio have less of a personal touch to them but are more than adequate opening and closing statements. What else did this Dessoff compose? Quite why it took nine years for this disc to be released I do not know.